Exer-submissives - A message to you CrossFitters who love the "Beatdowns"
Beating your body into submission is not healthy. Going to war on your fat is not good for you long term. There is no enemy inside of you that need to defeat and punish. It is not your (or your coach’s) job to exact retribution on yourself. For some people, this inclination of repentance takes a much larger and dangerous role. It becomes a manifestation of the disappointment and self-loathing that one feels after doing something ‘bad’. People who take this to the extreme are not only looking to do extra work because they ‘cheated’ or missed a few days of training, they have a sense that they need to be punished. They need to suffer. Pain is mandatory, and the longer the better. Bonus points if a coach or authority figure is there yell and push even more. 1. You are at war with an internal enemy (you aren’t). 2. The misinterpretation that PAIN = RESULTS always (It doesn’t). The pain during a particularly long and terrible workout, the pain of the soreness that lasts days, the pain of torn hands, the pain of jump rope lashes, rope burn on the leg, and even the pain from a lacrosse ball placed in the ‘right’ spot are NOT signs that you are making any progress. Do not get these signals confused with results! These are not weapons to use against the devious enemy inside of you who is trying to stop you from reaching your goals. 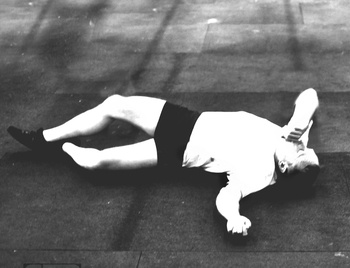 This confusion of pain and results is probably the most common and most dangerous part of CrossFit. Discomfort and pain are unavoidable symptoms of hard training, but better, faster, results come from smart programming and adequate recovery. Training ‘hard’ but not ‘smart’ is the surest way to injury, stagnation, and wasting inordinate amounts of time and money. Joint injuries, mild rhabdo cases, disruptions to training plans/programs are what come from the hard, painful, workouts – Not progress. Nowhere is this more evident than the ease at which it is to make a ‘hard’ workout (nausea-inducing, hand tearing, sore-for-4-days…) that earns you nothing results or performance-wise. Compare that to the difficulty of creating a workout that maybe ‘hard’ while it is happening, but it doesn’t take an excessively long time, leaves your body intact, you can train again the next day, AND you are a healthier person and better athlete afterward. Start paying attention to these thoughts of the ’10 Hail Marys’ workouts. Start asking yourself where the guilt is really coming from. Find out if you are trying to use pain and discomfort as a way to punish yourself for your transgressions. Try and direct that ‘need for correction’ into organizing a better meal plan for the next week and/or being extra consistent on your training for the next few days. Shift your view of your other self from ‘enemy’ to ‘impetuous child’. You don’t need to beat your body into submission; you need to set it up for success. You don’t need to go to war with your fat; you need to out-smart it. There is no enemy inside of you, there is a part of you that needs to be taught and lead down the right path. And if you find yourself having the ‘Exer-submissive’ thoughts again, stop and ask yourself what emotions are you really trying to erase. Then figure out how to fix the real problem so you can stop punishing yourself. Reposted from Thrivestry. See the original article here. https://notch8athletics.com/wp-content/uploads/2018/05/laid-out-black-and-white-medium.jpg 268 350 notch8athletics https://notch8athletics.com/wp-content/uploads/2018/02/Notch8Athletics-rectangle.png notch8athletics2018-05-08 21:35:162018-05-15 12:30:07Exer-submissives - A message to you CrossFitters who love the "Beatdowns"